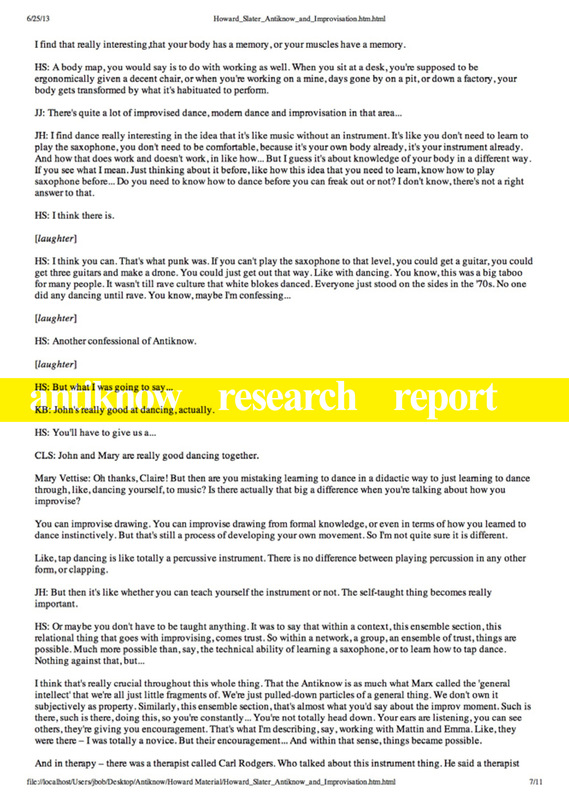 Published on the occasion of the exhibition Antiknow: A pedagoical theatre of unlearning and the limits of knowledge and consisting of the collection of Antiknow Research Reports produced by the Antiknow Research Group, this publication includes transcripts and leftover material engaged in elaborating possible meanings and consequences of the term Antiknow in the current context of so-called knowledge economy. 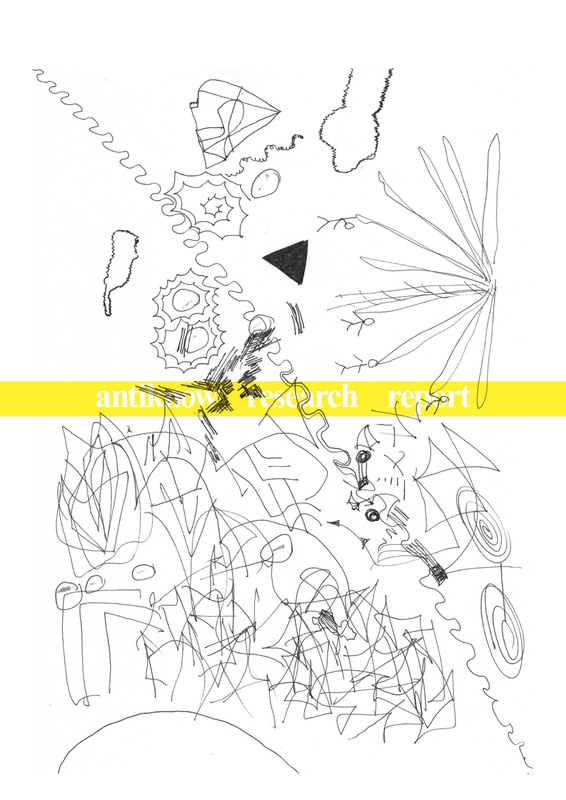 The Antiknow Research Group was set up by Jakob Jakobsen in April 2013 as part of a six-month residency at Flat Time House. The group, consisting of friends and Flat Time House associates, revolved around a series of meetings taking place in the Body Event/kitchen in the former home of John Latham. 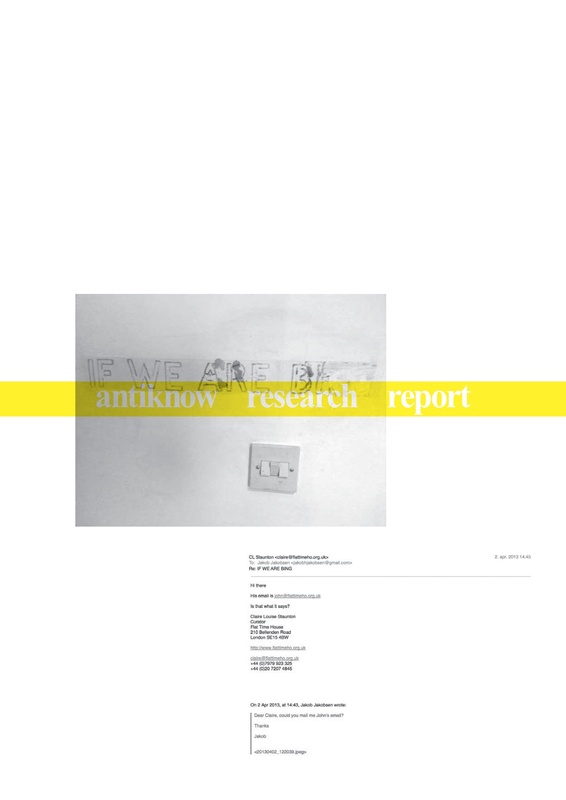 Antiknow was the title of the course John Latham presented at the Antiunversity of London in 1968. The Group aimed to engage in the knowledge struggles around 'the burnt edges of the textbook' regulating life in contemporary capitalism. Thanks to all who attended and contributed to the Antiknow Research Group meetings: Maria Berrios, Howard Slater, Marina Vishmidt, John Hill, Mary Vettise, John Cunningham, Henrik Heinonen, Claire Louise Staunton, Katriona Beales, Mohammad Namazi, Danny Hayward, Francesca Blomfield, Kari Robertson, et al. A pedagogical theatre of unlearning and the limits of knowledge. Directed by Jakob Jakobsen.